To start a large induction motor we use star – delta starter because large induction motors(cage type) with delta connected stator when started directly online it produces large starting current surges which cause fluctuations in voltage on the supply line. To prevent this we run the induction motor at the reduced voltage at the start of the induction motor and later on after getting require speed we operate induction motor at full supply voltage for this purpose we use star the delta starter. As discussed above to reduce fluctuations in voltage on supply line we need to reduce starting surge currents so we need to reduce the voltage at the start of induction motor for this purpose we firstly connect the stator windings of induction motor in star connection and later on we connect the stator windings in Delta to operate at full supply voltage. See the below circuit diagram how the star – delta starter is connected to the induction motor. During start position of the switch, the stator windings are connected in the star as shown in the following figure. Now the induction motor gradually picks up its speed. When the speed becomes 80 percent of its rated speed then the switch moves to run position as a result stator windings get connected in delta as shown in the below figure. To understand how voltage is reduced by star connection of stator windings see the below calculations. In star connection, the phase voltage is 1/√3 times of line voltage as the torque is directly proportional to the square of the voltage applied the torque is reduced to 1/3 times than the torque produced by starting with direct delta connection. VL be the line voltage. V1 is the phase voltage. Istyp be starting current per phase when the stator windings are connected in star. Istyl is the starting line current when the stator windings are connected in star. IstΔl is the starting line current by direct switching with the stator windings in the delta. IscΔp is the short circuit phase current by direct switching with the stator windings in the delta. In star connection, line current will be equal to phase current. This shows that with star delta starter, the starting current from the main supply is one-third of that with direct switching in the delta. 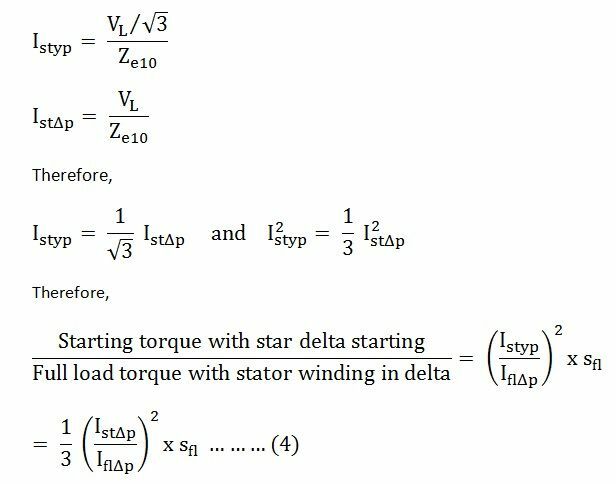 This shows with star delta starter, the starting torque is reduced to one-third of the starting torque obtained with the direct switching in the delta. So the above equations show how voltage and torques are reduced with star delta starter than direct delta starting.